What is SIEM and How Does It Support Security for Business? – Synivate, Inc.
What is SIEM and How Does It Support Security for Business? 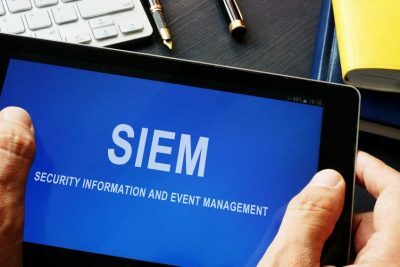 The term SIEM stands for Security Information and Event Management. SIEM is an approach to security management for businesses that combines SIM (Security Information Management) and SEM (Security Event Management) to create a more comprehensive system for security management. The basic goal of any SIEM system is to determine the best course of action based on relevant system data and the identification of any deviations or issues that might indicate a security risk. The SIEM system can be used to log information, generate an alert to IT department monitors, or initiate security controls designed to stop the progress of the discovered activity. SIEM systems can range from very simple to extremely complex, depending on the needs of the client. For example, an advanced SIEM system can include identification of the user, the behavior or activity, and initiate an automated security response. Basic systems can be rules-based, using statistics to identify potential issues within event log entries. The use of SIEM systems has grown in recent years, primarily due to compliance requirements for payment card industry data security standards (PCI DSS) and advanced persistent threats which can affect even smaller organizations. It is important to organizations of all sizes to have effective and efficient security information and event management support. Most of the SIEM systems that are in place today work by employing a variety of data collection agents which are used to gather relevant information regarding security events from any end-user services, network equipment, company servers, and security equipment. Advanced SIEM system agents can include specialized security options such as antivirus software, firewalls, and systems designed to prevent intrusion into essential company data. The collection agents forward information on these events to a central management console to provide the security team or management service with the data necessary to identify and prioritize certain security incidents. For larger organizations, some security information and event management systems can be created to provide pre-processing to only allow certain events to make their way to the management console, eliminating non-threat actions and common issues that are not a concern. This can reduce the amount of data that must be stored and reviewed; however the security information management and security event management parameters must be checked regularly to ensure that important issues are not being overlooked. Advanced SIEM system options can help to improve accuracy to increase effectiveness and efficiency over time as the system learns about the needs of the company environment. When determining which type of security information and event management systems are best for you and your company, it is important to work with a service provider that you can trust to deliver the best solutions based on your needs. Each industry has its regulations, requirements, and compliance issues that must be considered, but every business also has its own set of needs that must be addressed. Synivate can offer a comprehensive IT evaluation and consultation to determine the level and type of security information management and security event management services you require. The benefits of security information and event management are clear, offering companies that rely on technology to detect attacks that other systems might miss. Advanced SIEM system tools can be used to stop attacks that are still in progress and then learn to identify attacks to prevent them from occurring in the future. SIEM systems used to be designed primarily for large enterprises but have recently been applied to small and mid-size organizations as their needs have changed. A common and beneficial SIEM approach for many businesses consists of software installed on a local server or a virtual appliance that is dedicated to security information management (SIM) and security event management (SEM). This service can be done in-house through an IT department or third-party through a technology service like Synivate in the Greater Boston area. If you would like to learn more about security information and event management, contact our team at 617-517-0704. You can get a FREE IT assessment through our website to help get you started.